Here’s a bit of personal info for you: every Thanksgiving has been different for me since entering adulthood. No two Thanksgivings are alike. I’ve spent Thanksgiving surrounded by family, another surrounded by friends, another working (that year was a dud) but my favorites have always included Paul in the picture. The one thing that has remained the same for several years is the inclusion of seafood in our Thanksgiving festivities. The years it’s been just the two of us, we make it a seafood blowout extravaganza. Lobster, crab, shrimp — you name it. And we mix it up: lobster rolls one year. Crab legs the next. Etcetera. Even the years where we do decide to stick with tradition (i.e. turkey), we always try to include a seafood side dish. And that dish has almost always been the S.S. Spud. The S.S. Spud stands for shrimp-stuffed spud. I credit this delicious creation to the now defunct Famous Murphy’s, a Reno institution. This was the restaurant where Paul used hang out with his fellow coworkers after putting in a shift at the Gazette-Journal and he introduced it to me later on. 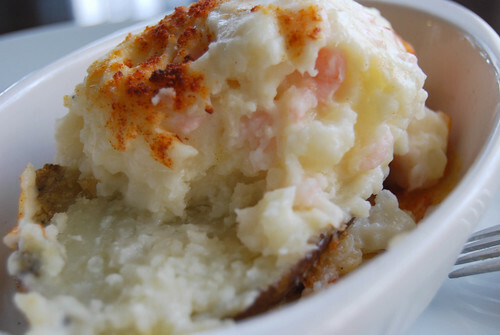 This twice-baked potato is mashed with cheese, sour cream and bay shrimp and topped off with a creamy mornay sauce. A definite must is generous squeeze of lemon to liven up the flavors. What good is seafood without lemon anyways? While this recipe serves two, it can be easily adjusted to serve many more people at your Thanksgiving shindig. Alternatively, each twice-baked potato can be substituted for a large bowl of mashed potatoes. Just be sure to adjust the sour cream, cheese, shrimp and mornay sauce. 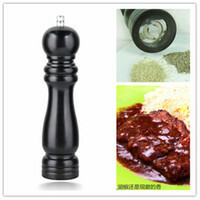 This dish can be made a day in advance and reheated in the over prior to serving. Wash and dry potatoes and prick with a fork. Bake potatoes for an hour and 15 minutes. 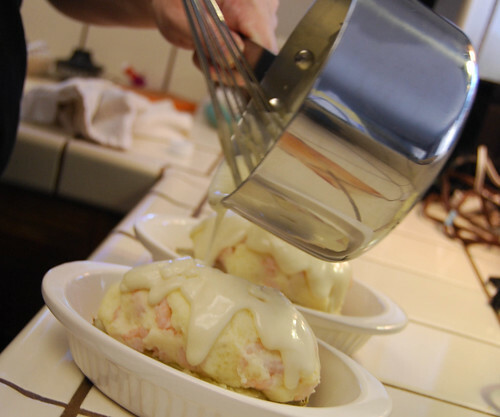 Mornay sauce: While potatoes are baking, heat a medium saucepan over medium low. Add butter until melted. Gradually whisk in flour. Slowly add milk while stirring constantly until mixture boils and thickens. Add salt, pepper and cheese until cheese is throughly melted. Remove potatoes from oven and cut off bottom quarter of each potato. Transfer bottoms into baking dishes. Scoop the potato from the skins and place into a bowl. Add a large pinch of both cheeses, butter and sour cream to the bowl and mash until well-combined and fluffy. Fold shrimp into the potato mixture. Form potato mixture into oval ball and place ball on top of the reserved potato. Repeat with second potato. Top each potato ball with more Parmesan and Romano cheese, followed by Mornay sauce (enough to coat the entire top of the potato). Sprinkle with paprika. Bake for 400 degrees F for an additional 15 minutes or until hot. Serve immediately with lemon wedges. *Paul also wrote about this is 2008. Yum! Yours looks exactly like the one from Famous Murphy’s. I think I’ll have to make this for our mini Thanksgiving at home this year. That… looks really tasty. Too bad Jake wouldn’t eat it, him and his weird anti-seafood ways. I just won’t put shrimp in his. More shrimp for me! There is a thread on SeriousEats where someone is asking about ideas for a pescetarian Thanksgiving. I commented that I didn’t really think seafood goes well with the heavy sides of a traditional Thanksgiving meal and Thanksgiving just doesn’t bring images of fish to my mind! But I think this dish changes everything! I could really go for this with all the trimmings at Thanksgiving. Thanksgiving isn’t the same without this for us. We enjoy it that much and have friends who always want to take some home after the celebration. Hey that looks really great! I’m thinking of a version with scallops as I’m not a huge shrimp eater. That would be an interesting take with scallops. Let me know how it goes, Dennis! Heh heh… what ever happened to her?? Darlene- I love the tradition of adding seafood to the mix. And though, adding shrimp is new to me, it looks nothing short of ahhmazing. I love potatoes and shrimp, what a clever idea from Famous Murphy’s. And that sauce is just the icing on the cake. Kudos to YOU! 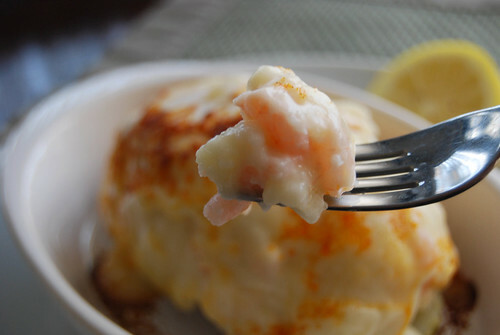 Shrimp AND mashed potatoes are so good! Hope you have a chance to try it soon, Jenny.